The Amway Darjeeling Police Marathon sponsored by The Telegraph had international participants, from as far away as Ethiopia and Kenya, but the winner in the male category was a Darjeeling runner. Around 1,500 runners took part in the 21km half marathon which was flagged off at Sukhiapokhri today. The event was organised by Darjeeling police in association with the Gorkhaland Territorial Administration to commemorate the 153th birth anniversary of Swami Vivekananda. 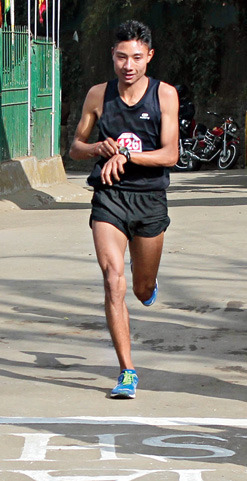 Ajay Chhetri, 22, from Shivgram in Darjeeling who started running after joining the Jammu and Kashmir Rifles two years ago, stole the show by winning in the male category. Punjab's Kiranjeet Kaur, 22, won in the women's category. "When I joined the Army, the officers asked me to concentrate on marathons after watching me do cross-country running during training. It is then that I put on my running shoes. I came fourth in this marathon last year. I am happy to win this year," said Chhetri. In the past two years, Chhetri has run six half marathons across India. Today, he completed the run, from Sukhiapokhri to Chowrasta, in 1 hour 10 minutes and 39 seconds. From the start to the finish line, Chhetri held the lead with two Ethiopian and two Kenyan runners following him closely. Tewodros Haile, 32, from Ethiopia, came second clocking 1 hour, 11 minutes and 5 seconds. "The run was beautiful, but I had never trained for a marathon in a hilly terrain. After 18km, I was extremely tired," he said. Haile added that he has taken part in 11 marathons across the world. "I have run in Ukraine and United States among other countries. Even in India, I have participated in six marathons so far," he said. The four Ethiopian and Kenyans runners came to know about the event from the Internet. "We usually browse the net to find out about marathons and that is how we came to Darjeeling," Haile said. Vikash Kumar from Delhi was the second runner-up in the men's catergory. In the women category, Kiranjeet clocked 1 hour 25 minutes 8 seconds. Seema Khatoon, from Delhi, and Monika Chowdhury, from Uttar Pradesh, were the first and second runners-up, respectively. The winners in both men and women categories got a cash prize of Rs 1.5 lakh each. The first and second runners-up won a Rs 75,000 and Rs 50,000 each, respectively.